Kiribati has survived some close calls in their group stage matches this morning at the 2018 Gold Coast Commonwealth Games. It took Tauramoa Miita five match points to defeat Terry Su from Belize. Miita had chances to close things out in the sixth game, but sent a high ball in to the net to let Su back in to the match. Eventually the sixteen-year-old got over the line, 14-12 in the seventh. It was an impressive match, with Miita praising his opponent’s backhand and service game, while also admitting he was nervous heading in to the deciding game. 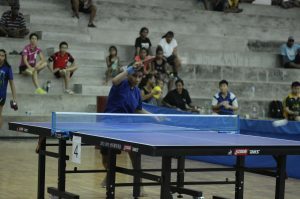 Meanwhile, Mitta’s teammate Allie Johnny dropped just one game on his way to a win over Sierra Leone’s Emmanuel Gboyah. Check out the full results so far from today’s matches here.